In life we all make decisions by weighing the pros and cons, however often the ultimate deciding factor ends up being intangible. Cluster box units provide end users convenience and security that is difficult to measure. Small and medium sized parcels can delivered securely when cluster box units are the distribution receptacle of choice which minimizes unnecessary trips to the local post office. Everyday outgoing mail can be deposited securely into the cluster box unit which provides additional convenience for your tenants. Cluster box units also provide a strong defense against less than well intended guests who are looking for easy targets for their own financial benefit. Most if not all of these predators walk away frustrated because their mischievous goals have gone unmet due the cluster box units quality construction and security features designed to prevent identity theft. 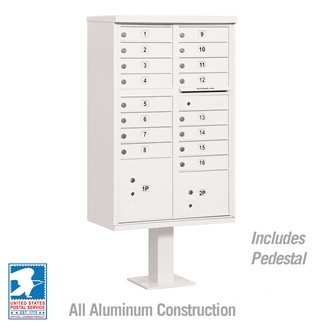 F Series and Regency Series cluster mailboxes are manufactured from stainless steel and aircraft aluminum meeting AND exceeding the current "F" specification put forth by the USPS about a decade ago. Sixteen door cluster box unit has resident door compartments that measure 12"W x 3 1/8"H x 15"D which is in accordance with postal capacity standards. 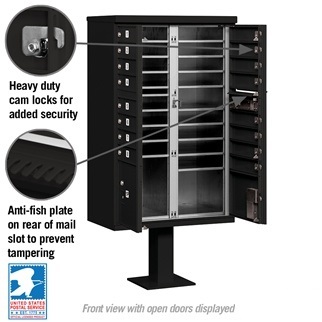 16 door cluster mailbox has two package lockers to provide convenience for your residents that measure 12"W x 10"H and 12"W x 13 ½"H.
Thieves and vandals are sure to become frustrated with our minimal pry point design, anti-fish plate to discourage mail fishing, and durable powder coat finish to resist scratching. Robust tenant locks (3 keys furnished) discourage unwanted visitors. 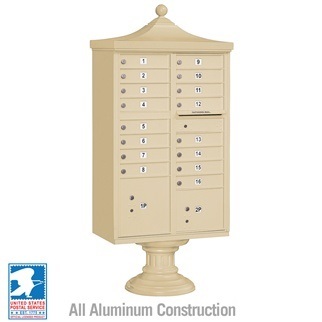 Cluster mailboxes will have the outgoing mail compartment prepared for the postal arrow lock. 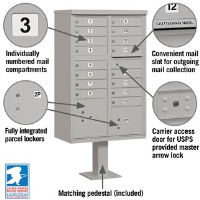 The arrow lock is provided and installed by your local Post Office at no cost typically. 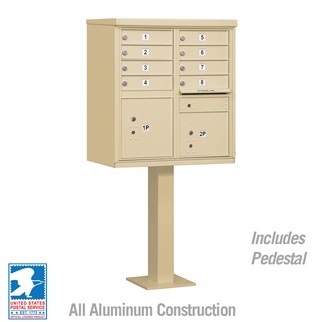 All mating hardware for your cluster box unit is included in your purchase; however anchor bolts for mounting the pedestal to the concrete pad are not included. 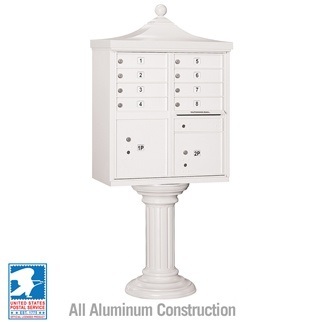 USA Building Supplies cluster box units are USPS Approved. The sixteen door cluster box is commonly referred to by Postmasters throughout the country as a Type III cluster box unit. 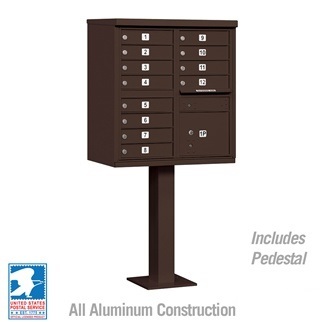 USA Building Supplies includes a corresponding pedestal in our prices. Cluster box units comply with ADA guidelines. (+$80.00) Custom engraved door identification for cluster boxes offers the customer a permanent clean door identification option. The engraved characters on your compartment doors will be silver with this door identification option because the unit is manufactured from aluminum. (+$80.00) Custom black filled engraving adds a touch of class to your mailbox. Each cluster box unit door is engraved with the characters you specify and then filled in with a black ink to enhance the door identification. Shop our complete selection of F Series Cluster Mailboxes now for USPS Approved, centralized delivery solutions.